An estimated 103 million Pakistanis, or 63% of the population, are younger than age 25, and this number is expected to double over the next 30 years. In a landscape of endemic poverty, a literacy rate of only 53 percent among young people aged 15 to 24, and limited job opportunities, organizations like The Hunar Foundation (THF) are working to transform Pakistan’s human capital into an asset for the country. 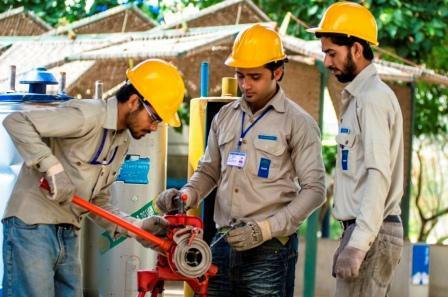 Developing vocational skill programmes that enhance prospects of income generation for Pakistani youth is one of the national government’s key priorities for rapid economic growth. THF`s main objective is to provide young men and women with quality vocational education that meets the technical skill needs of the marketplace – leading to wage-earning capabilities for life. To accomplish the vision of “A Skilled Pakistan,” THF plans to establish 35 purpose built Institutes of Excellence for student vocational training, and as many as four Teacher Training Centers over the next 10 years. The goal is to graduate at least 100,000 students during this time.